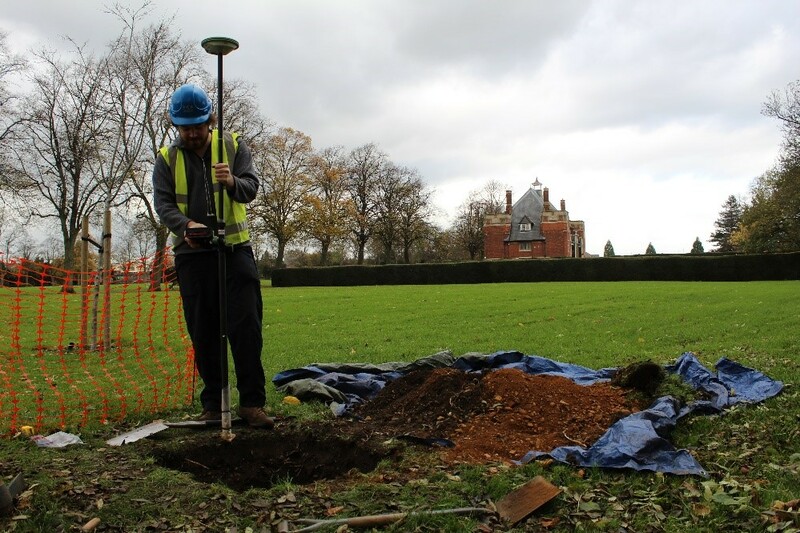 Pre-Construct Archaeology was commissioned to undertake an archaeological evaluation at Abbey Park, Leicester. Abbey Park falls within the precinct of the former 12th century Augustinian monastic site of St Mary of the Meadow, a scheduled ancient monument (List No. 1012149) and grade II registered park and garden (List No. 1000956; DLC435). Following Dissolution in 1538, the majority of the buildings were demolished. A mansion was subsequently built at the site, occupied first by the Hastings family and then by the Cavendish family. The precinct wall remains largely extant. Building material was recovered and used for the construction of Cavendish House in the later 16th and 17th centuries, although this house was largely destroyed in 1645 during the English Civil War when the town was first occupied by Royalist troops and then Parliamentarian forces after a short siege. Cartographic evidence suggests that the area of investigation was to the south of the main precinct in the nursery area, in lower lying and potentially marginal land. Whilst sherds of Roman and medieval pottery were recovered during the investigation, the fieldwork confirmed that medieval and earlier horizons were buried beneath thick deposits of later 19th and 20th century ground raising and levelling deposits. The archaeological investigations were undertaken whilst the park and outdoor gym area remained open. The fieldwork was adapted to ensure that disturbance to the general public was minimised, whilst at the same time being undertaken in accordance with the requirements of the Local Authority and Scheduled Monument Consent. 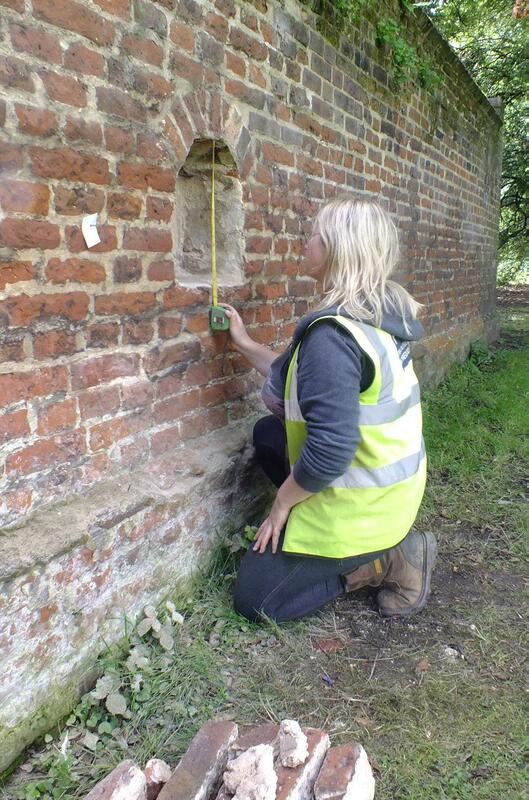 PCA was commissioned to undertake archaeological works within the Walled Garden at Fulham Palace. Various projects were undertaken between 2012 and 2016 including built heritage recording, a watching brief and a volunteer-based excavation. Scheduled Monument Consent had been granted to introduce a formal orchard and further planting including the reintroduction of trained fruit trees. The orchard project formed part of a public archaeology project where dedicated volunteers excavated tree pits under the guidance and direction of PCA’s professional archaeologists. Built heritage recording was conducted on two gateways; one located between the boundary grounds of Fulham Palace and the churchyard of All Saints Church. The results of the excavation revealed features including planting holes, beds and rubbish pits. Sixes phases of activity were established running from the 18th to 20th century. Three bricked up bee boles (recesses in the garden wall) were also present, which would have housed skeps (coiled-straw hives). Two of these were recorded in this state before a conservator restored and removed the later bricks. All projects were completed to the highest quality with clear lines of communication between PCA and the client. The work was completed on time and to budget. PCA provided further archaeological support to a volunteer project in 2017, which sought evidence for an early post-medieval dovecote.